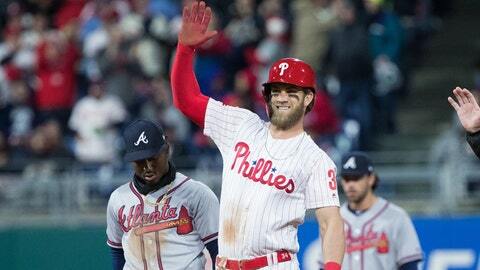 The Philadelphia Phillies committed nearly $500 million to upgrading their roster this offseason and it paid immediate dividends with a season-opening series sweep against the Atlanta Braves. The Atlanta Braves are the only winless team in baseball after a convincing three-game series sweep by the Philadelphia Phillies to open the 2019 season. The Braves were outscored 23-11 and if wasn't for Charlie Culberson's ninth-inning, pinch-hit home run on Saturday evening they never truly challenged Philly throughout opening weekend. It’s early and the last time a non-rebuilding Braves team suffered a season-opening sweep the team went on to win 94 games and capture the 2012 NL East crown. The absence of pitchers Mike Foltynewicz, Kevin Gausman, A.J. Minter and Darren O’Day was also notable considering the circumstances. Philadelphia looked as good as advertised throughout opening weekend, though. Owner John Middleton’s “stupid” money went a long, long way as new additions Bryce Harper, J.T. Realmuto, Andrew McCutchen and Jean Segura combined for 11 hits, nine walks and five home runs in the season’s first three games. Throw in a couple 1.600-plus OPS series performances from returnees Rhys Hoskins and Maikel Franco and little went right for Atlanta. If there was any doubt as to how much more difficult the path to consecutive NL East crowns became with the additions of that Phillies quartet, Patrick Corbin (Nationals), Robinson Cano and Edwin Diaz (Mets) — among many, many others moves from the hyperactive division — Philadelphia just erased it. The most encouraging Braves pitching performance of the entire weekend at Citizens Bank Park was delivered by none other than Julio Teheran, whose uptick in velocity and high slider usage resulted in an Opening Day start worth the optimism that followed him out of spring training. The veteran right-hander carries a 5.40 ERA right now. That pretty much sums up the entirety of the weekend for Atlanta’s shorthanded pitching staff, a forgettable series against a lineup it will eventually need to figure out. Rookie starters Bryse Wilson and Kyle Wright did not lose games for Atlanta, but neither right-hander was sharp in his season debut. The bullpen — not to mention various bullpen-related decisions — was no match for the Phillies' high-powered offense. That relief corps boards the flight home allowing more than a run per inning. 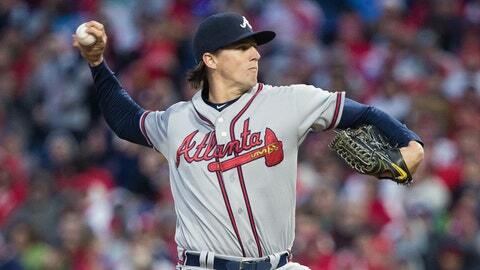 More frustrating for Atlanta's coaching staff, however, is the familiarity of the pitching problems. Dating back to Game 1 of the NLDS against the Los Angeles Dodgers, the Braves have walked 47 batters in their past seven non-exhibition games ... and they did not even have to pitch in the ninth inning for five of those games. Getting healthy will help. Throwing out better arms in high-leverage situations will help. The organization's stockpile of pitching prospects will certainly help over the course of 162 games. Overreacting to three road games without three of the franchise's best arms makes little sense, but there's no denying that the 2018 pitching demons have yet to be exorcised. 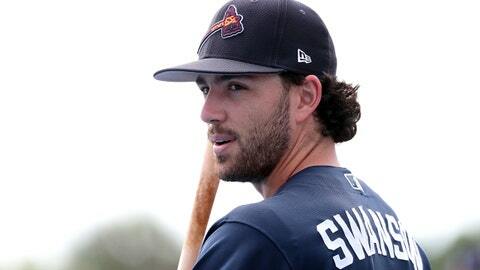 Dansby Swanson has not come close to reaching the potential that virtually the entire baseball industry saw in him when he was tabbed as the 2015 No. 1 overall draft pick and consensus top-10 prospect. There’s a chance that star potential will never be realized, but there’s a very real chance the baseball world has yet to see the best version of the Atlanta Braves shortstop — a scenario supported by his strong showing in Grapefruit League action and fast start in Philadelphia. Public opinion too often turns on young players who do not pay immediate dividends. Expectations can eventually lead to disappointment, but players are not finished products at 23 years old — in many ways, they never are. Pitchers add or “design” new pitches, tweak their mechanics, alter pitch usage and sequencing or excel in different roles for different clubs. Hitters can adjust their swings or utilize available data to improve fielding through defensive positioning. The possible variations of any given baseball player could make for an extensive list. Swanson has shown extended flashes of the toolsy shortstop — though not possessing one standout tool, he can affect every phase of the game in a positive way — both in his first taste of major-league action (nearly one win above replacement in his first 38 games as a 22-year-old) and in his pairing with Ozzie Albies before suffering a left wrist injury on April 14 last year. Atlanta’s shortstop was never the same after his fast start. He still put together a Gold Glove-caliber season but he underwent surgery on Nov. 5, shortly after his second straight disappointing season at the plate. But Swanson is not resigned to being the .315 career OBP player hitting 23 percent below league average in the golden age of offensive shortstops. And if the early returns on the re-strengthened wrist are any indication, Swanson’s best offensive days are ahead of him. While researching to find a manageable-yet-ambitious path forward for the Vanderbilt product, two former MLB shortstops/infielders stood out: Michael Young and J.J. Hardy. Both 6-foot-1, right-handed shortstops in their heyday (sound familiar? ), Young and Hardy were never superstars or household names, but they proved to be instrumental pieces on winning teams over the course of their careers. Swanson just posted a better Year 2 by a significant margin despite an injury. Now it's time to take that next leap — and it's a significant one. Young was a seven-time All-Star who played for Ron Washington’s World Series teams in Texas. Hardy was a two-time All-Star and three-time Gold Glove winner who helped five different teams reach the postseason. Swanson might never reach their level of consistency. He might surpass them. He’s 25 years old entering a season brimming with breakout potential. If he’s even close to a league average hitter, he’s a 3-4 WAR player who helps Atlanta in every phase of the game. If his .353/.421/.559 spring slash line was not a complete fluke and if the shortstop who turned on a 96-mph Nick Pivetta fastball in Citizens Bank Park is a sign of things to come, there's going to be a crowd trying to jump back on the bandwagon.